This column is from The MagPi issue 55. You can download a PDF of the full issue for free, or subscribe to receive the print edition in your mailbox or the digital edition on your tablet. All proceeds from the print and digital editions help the Raspberry Pi Foundation achieve its charitable goals. Since the original Raspberry Pi Zero came out, I’ve seen many makers using it for connected home projects. Its size, low price, low power consumption, and software package have made it a great option, even if makers had to use a USB peripheral to add connectivity. Now that wireless LAN and Bluetooth connectivity are built into Raspberry Pi Zero W, it makes this mini computer platform even better suited for home Internet of Things projects. Let me get this out of the way first: ‘Internet of Things’, or ‘IoT’, has all the trappings of an overhyped buzzword. But even if the term Internet of Things doesn’t stick around very long, the concept of connected devices is here to stay for good. It’s a clear side effect of increasingly affordable wireless connectivity technology. It’s not just development boards that are becoming more connected. The consumer electronics devices that we buy for our homes are more likely to have wireless capabilities. Even a product as simple as a light bulb can be equipped with connectivity, so that you can control its intensity and colour with a mobile app or home automation platform. I recently connected our Google Home to our WeMo Smart Plugs so that I can control the lights in our home using my voice. Last week I was carrying a load of laundry into a dark bedroom. Being able to say “OK Google, turn the bedroom lights on” and having it instantly do just that was a magical moment. Learn to use Amazon Dash buttons with Raspberry Pi. If you want to go beyond the basics, there are cloud-based platforms that let you manage many devices at once, and create intelligent alerts and actions. Many platforms are already Raspberry Pi-friendly, including the Particle Cloud, Initial State, Cayenne, and Resin.io. Each has its distinct advantages. For example, Initial State makes it really easy for you to create custom web-based dashboards to show you the state of your own sensors and internet-connected devices. 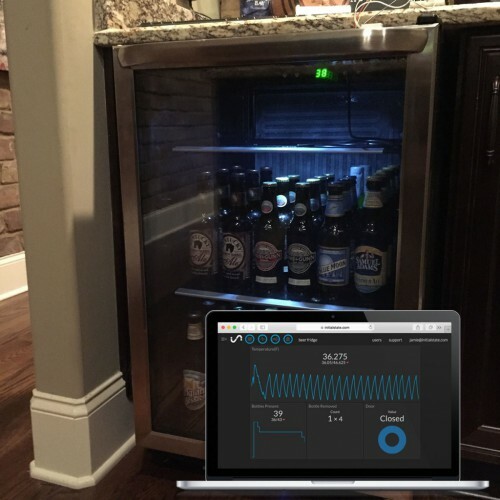 Initial State’s Beer Fridge of Awesomeness project is perfect for Pi Zero W.
And if you’re a beginner, there are platforms that make it easy to get started with connected devices. One in particular is called IFTTT, which stands for ‘If This, Then That’. It’s an easy-to-use service that lets you connect consumer and maker platforms together without needing to write any code. IFTTT can also go beyond your devices: it can interact with the news, weather, or even local government. In the first partnership of its kind, the City of Louisville, Kentucky recently announced that it’s now on IFTTT and sending real-time air quality data, which you can log or use to trigger your own projects. I hope that it’s just the beginning for IoT partnerships like these. 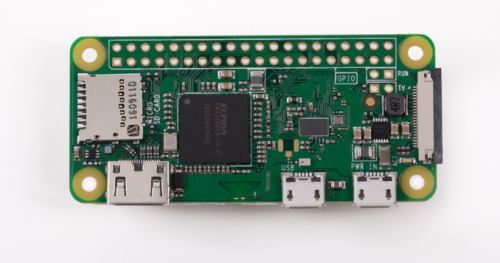 With all the recent developments in the Internet of Things realm, Raspberry Pi Zero W comes at the perfect time to offer affordable, portable, and connected computing power. The best part is that exploring IoT doesn’t mean that you need to go too far into uncharted territory… it’s still the same Raspberry Pi that you already know and love. sorry..I see the link now…. I swapped in a Pi Zero W in my weather station yesterday – I’ve got a “WSDL WxShield for Arduino” on an Arduino Uno, which has a highly accurate thermometer and hygrometer and a 433MHz radio receiver (which listens to a handful of off-the-shelf remote sensors), which outputs a continuous stream of data, and it’s connected to a Pi Zero W (now) running a few thousand lines of Python that decodes and converts all the raw data into human-recognizable numbers, which it then publishes to an in-house MQTT server (and a Pi 3B with the official 7″ touchscreen subscribes to that MQTT data and gives me a lovely continuous display of current conditions). I swapped a PiZero for a PiZeroW to turn my Bow Tie IoT enabled. Here’s my little IoT smart switch project using the new Pi0W! Currently using it to control the Phillips hue system in unique ways! Great Post man! Definitely going to pick up a Pi zero soon enough, idk why but I found it humorous that you used amazon dash buttons haha. Using a Raspberry Pi Zero in IoT projects is not only useful for home automation but can also be applied in your car. I’m using Raspberry Pi Zero W to create an integrated Home Security System, including PIR motion sensors, vibration sensors and a Pi Camera V2.